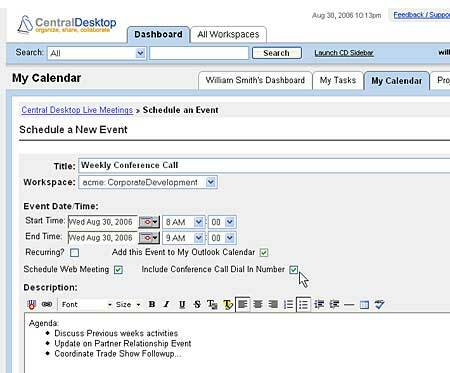 Central Desktop is a typical representative of the modern SAAS (software as a service) project management products. The application is easy for newbies, the interface is intuitive, plus the application provides various tips, tutorials and videos, guiding you as you take your first steps. Various workspace options are available: project workspace (with ‘a la carte’ option that allows customizing it), wikis, and corporate blogs. You can also set access permissions for workspaces and make them public or personal. Newly created desktops can be populated with sample information to give new users a better understanding of the content structure. The project workspace has the tabbed structure giving access to tasks, team members, files and discussions, project milestones, etc. Project files and documents are managed in a single environment. Central Desktop is keeping track of document upgrades to ensure that everyone is aware of the changes. This helps avoid problems with multiple updates to files that often happens using email correspondence. User-friendly text editor allows creating new documents without leaving the Central Desktop application. The tasks in Central Desktop are grouped in task lists for better task management and can be linked to the project milestones. This allows for basic reporting, yet there is no task hierarchy, so it is impossible to build the work breakdown structure. Central Desktop can help you manage the contact information for the projects. This functionality is very neat and can be very useful to create a database of client-staff contacts for the company. Web meeting option in Central Desktop successfully eliminates the communication gap between remotely located departments, and creates the opportunity to communicate with clients effectively. The application is offered with 1 month free trial (without asking you for the credit card details – so no catches here). The monthly pricing is near 100 British pounds. The functionality can be extended with extra paid features.